Mrs. Henry Carleton, one of the earliest residents of this locality passed away on Sunday, Mother’s Day, after a long illness. Emma Gergen was born at Ashford in Fond du Lac County, Dec. 24, 1862. In 1867 she came with her parents to Clark County. The family lived for a time at Staffordville and then moved to a farm in north Grant. 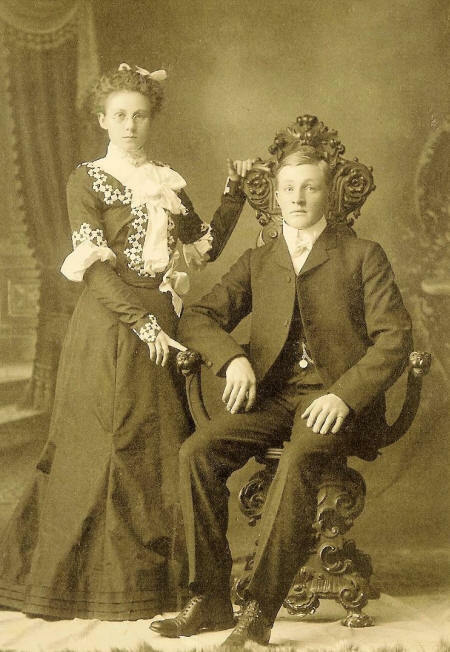 On Dec. 20, 1880 Emma Gergen was married to Henry Carleton and they went to live on a farm in Grant. Later they bought a farm in the town of York which was their home until 1906, when they sold this farm. Returning from a trip to Oklahoma soon after, they bought a home in Pine Valley which was their home until 1929 when they went to the Veterans Home near Waupaca remaining for about a year. Mr. Carleton died in 1930 and since then Mrs. Carleton and her daughter, Mrs. Belle Butterfield, made their home in Neillsville. Mrs. Carleton’s life has been similar to that of hundreds of pioneer women- apparently uneventful and devoid of drama or adventure, yet filled with the minor details that, could they be collected and recorded, with their full significance, would make a story of touching interest. Coming here as a child, when this entire region was mostly wilderness, she saw the active and thrilling times of the lumber camps, the clearing of forest lands and opening of settlers’ home; then later the development of farm homes and dairies, the building of modern highways, and other vast changes in our mood of life. For many years in her home she took an active part in this program of life, but as health and strength failed she became more and more an on-looker. She served well and faithfully her day and generation. Mrs. Carleton leaves one daughter, Mrs. Belle (Frank) Butterfield, who for several years has been her mother’s constant companion, caring for her in old age and ill health. She leaves also three sisters, Mrs. (Hattie - formerly married to Fred Kier) Wheeler Forman, Neillsville, Mrs. Margaretta "Maggie" (Francis) Furlong; St. Paul; Mrs. Grace Lester, Minneapolis; and two brothers, Vernon and Alfred Gergen. Senator Walter Rush is a cousin. Mrs. Carletpn was a regular attendant for a number of years at the Congregational church, but was not a member. She was a member of the Royal Neighbors. Funeral services were held Wednesday afternoon at Lowe’s Funeral home, Rev. G. W. Longenecker of officiating. 1940 Federal Census, Neillsville, Neillsville City, Clark, Wisconsin, United States, North Emery St.
1942 WWII Draft Registration, Tillamook, Oregon, United States, Men born Apr. 28, 1877 and or before 16 Feb 1897. Mont Butterfield died at the home of his father-in-law, Henry Carleton.